On October 24 1805, explorers Meriwether Lewis and William Clark reached a series of violent, roaring cataracts of whitewater on the Columbia River. “The horrid appearance of this agitated Swelling (water), boiling & whirling in every direction”, wrote Clark. Even the local native Indians, highly skilled canoeists themselves, would never venture down these rapids. By today’s standards they would have been class V rapids—dangerous even for expert canoeists. After examining the waterfalls (called the Short Narrows), Lewis and Clark decided to portage their most valuable items such as scientific equipment, written notes, and rifles, around them, while those in their party who could swim would attempt to ride the canoes down the rapids. The natives eagerly lined the river banks to watch the white men come to an inglorious end in the turbulent water, and prepared to claim their abandoned equipment when it floated to the river banks. The explorers emerged safely at the other end of the rapids to the amazement (and probably great disappointment) of the natives. That evening Lewis and Clark camped on a high point of rocks below the Celilo Falls, about two miles upstream from where The Dalles (Oregon) stands today. Describing the day’s passage, one of the rafting party wrote, “We had a fine morning and proceeded on early, found the water very rapid below the falls; and having gone 4 miles below the narrows, came to other narrows still more confined and the rocks higher. At the head of these narrows we halted about 2 o’clock at a great Indian village, and remained there all night”. Lewis and Clark described the 20 or so buildings as large wooden buildings, with some covered over by earth. Located at the intersection of several Native American trails, the village had long been a center for trading goods like smoked salmon, shellfish, cedar crafts, baskets, canoes, obsidian, tobacco, baskets, horses, animal hides, pipestone, and turquoise. For 11,000 years before Lewis and Clark arrived at the native village, the natives lived here, hunting game and catching salmon in the falls. The next day, on October 25 1805, a few miles further downriver, the explorers rode the next set of rapids (known as the Long Narrows) while the natives waited to witness disaster, only to be disappointed again. One boat was swamped, but the men were fine, and nothing was lost. Then, on their return journey, on April 19 and 20, 1806, Lewis and Clark camped above the Long Narrows (on the Washington side) of land near a Skillute village. A century later, the lands above this village would become The Dalles Mountain Ranch, a sprawling working farm. It covered a large swath of land about one mile inland from the shoreline of the Columbia Hills on up the northern slopes of the Columbia Hills to the crest at 3,000 feet. In 2003 the ranch was bequeathed to the State of Washington and combined with the already existing Horsethief Lake State Park (which is where the Skillute Village once stood) forming Columbia Hills State Park. The combined area of the former ranch and Horsethief Lake State Park now make up a 3,338-acre Columbia Hills park, with 7,500 feet of the Columbia River shoreline. Columbia Hills State Park offers some marvelous historic and recreational attractions that are well worth visiting. The area where Lewis and Clark camped in April 1806, now Horsethief Lake, is designated a National Historic Site, of course. The Army Corps of Engineers built the Dalles Dam across the Columbia in the late 1950’s, creating a considerable reservoir above it, which formed the curved lake where Lewis and Clark had once stayed. Covering 90 acres and over a half mile across, the engineers named it Horsethief Lake because they thought the area looked like a typical horsethief canyon hideout from the Hollywood westerns of that era. A few hundred yards north of the lake, Horsethief Butte towers like a fortress over the skyline of the Columbia Hills State Park, with a variety of hiking paths leading up to it, along its flanks and crisscrossing across the top. No fees or permits are required for the Horsethief Butte trail, which is a 2-mile out and back hike. The trail is rated easy, with many hikers walking it year round. The horseshoe-shaped Butte is a geological marvel carved by the great floods of the last ice age. Over 100 feet tall, six distinctive layers of basalt lava flow are seen in its base, remnants of the massive Wanapum lava flows, from 15 million years ago. 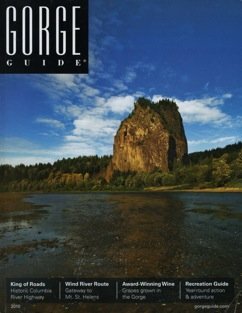 These tall basalt columns of Columbia Hills are excellent for rock climbing, and you’ll often see weekend rock-climbing schools in action there. And the views from the top of the Butte are spectacular for climbers and hikers—the Columbia River forging her way down the mighty Gorge, white capped Mt. Hood to the south, tall black and gray layers of basalt rock of the Columbia Hills, and on a clear day, the golden wheat fields of Oregon rolling south as far as you can see. But Columbia Hills State Park offers much more than hiking, climbing, and great views. In 2004, a self-guided interpretive trail lined with 42 large relocated rock petroglyphs and about 100 other images was opened. The Temani Pesh-wa (“Written on Rock”) Trail displays petroglyphs of owls, elk, bighorn sheep, eagles, human figures, and demons—see what else you can identify using your imagination. The petroglyphs are viewed from behind a wooden fence, on a long paved walkway. Signs show photographs of the carvings and tell about their original locations. The “She Who Watches” Pictograph trail continues down the river, showing hundreds of pictographs. The cliff walls are just covered with images. Although closed to the public due to vandalism, this trail is open for guided tours by appointment. This includes the Park’s best-known petroglyph, Tsa gag lal al, or “She Who Watches”, a large ochre colored carving of a face that looks down on visitors, her large oval eyes watching you from wherever you stand. This trail can be viewed by reservation, between April and October on Fridays and Saturdays, at 10 am. There is no fee for the tour. Call 509-767-1159 for reservations. A small number of Native drawings are also found randomly around Horsethief Butte on some of the more hidden rock faces. They are not always so keep your eyes open while you’re clambering around the trails and knolls on the Butte. Signs warn visitors not to deface the drawings and antiquities. Some are marked to keep rock climbers off them, and the areas are under surveillance. And look out for other cultural landscape features like rock cairns, rock dugouts, cultural features where the natives have changed the landscape. I ask Ranger Fritz Osborne, who’s been at the Columbia Hills State Park for seven years, how old these petroglyphs are. He tells me, “They haven’t been specifically dated, but based on styles connected with archeological research elsewhere, which have been carbon dated, some can be dated to roughly 350 years old. There are abstract styles and specific motifs that we know are 300-350 years old and others that are more universal, which can be thousands of years old. Some of the basic style designs run a wide range of dates as old as 3-5000 years old”. Osborne adds, “There’s an area nearby where fish bones were carbon dated to10, 000 years old, so we know people have been living here at least that long. The ice age floods wiped the slate clean, and relatively new rock images could have been created as early as 10,000 years old. We don’t know for sure”. He says, “The same site was used repeatedly again and again, so there are areas with old images and right near them are newer images”. When asked what tribes made these petroglyphs, Osborne tells me,” Almost all of the images were made before there were tribes as we think of them today. Some of the natives refer to them as river people”. Many families in the area today are descendants of the old Wishram village (or Nixlu ‘idix), Spearfish village, Celilo Village and Colowesh Bottoms. “It was only about a hundred and fifty years ago that the native peoples were forced to pick a tribe as part of the reservation relocation program”, Osborne explains. “The reservations were a clumsy reorganization often forcing the river people to pick their tribes, and were not representative of their real culture at the time. Some natives never joined a specific reservation because there were just so many family connections up and down the river and across it as well.” Lewis and Clark, during their expedition through the Dalles area, noted that different tribes spoke different languages just a few miles apart. A woman had a house in this area where the village of Nixlu’idix was later built. She was chief of all the fishing people who lived in this region. This was long ago, before Coyote came up the river and changed things. Coyote and the chief got into a fight and coyote threw her into the rock telling her, “You will not longer be chief, but you will stay here and watch over your people forever.” All the people of Nixlu’idix know that She Who Watches sees all things, for whenever they are looking up at her, those large eyes are watching them. Collectively, these remarkable collections of rock imagery at the Columbia Hills State Park are considered to be some of the most significant Native American cultural artifacts in the Northwest, and are certainly the largest concentration of prehistoric native art in the region. A few petroglyphs are also displayed at the Maryhill Museum of Art and in the Columbia Gorge Discovery Center. The story behind these petroglyphs trail is interesting. The early Indian ancestors carved these images and pictographs in the rocks next to the river, in a canyon upstream of where the Dalles Dam is today. “Many of the images were part of personal, private “vision quest” art so only the creator of the image would really know what they meant”, says Osborne. They were created so long ago that the origins and meanings of some of the petroglyphs had long since faded from the memories of the natives. When the Army Corps of Engineers built the dam in 1957, it flooded the native village area where Lewis and Clark had camped, and Petroglyph canyon. Thousands of the petroglyphs were inundated when the Dalles Dam flooded the canyon. Fortunately, many of the petroglyphs were removed from the canyon and placed in storage until a site could be found for them. A number of graves from a nearby ancient burial ground were also reburied on higher ground. Flooding the area above the dam also meant that many of the landmarks that Lewis and Clark wrote about are now under water. Other recreational activities at Columbia Hills State Park include swimming, boating, fishing and wind surfing in Horsethief Lake and the Columbia River. There are picnic tables and a campground in the State Park. Columbia Hills State Park is a great way to spend a day, or even an overnighter, in the Gorge. There’s plenty to do and see, and The Dalles is only a 10-minute drive away. Columbia Hills State Park/Dalles Mountain Ranch is located on the Columbia River on the state's southern border in Klickitat County. From Oregon: Driving east or west on I-84, take exit #87 and drive north on U.S. 197 across the Columbia River Bridge. Continue north about 2.5 miles to SR 14, and turn right, heading east. The park is located at milepost-85. From Washington: Drive east or west on SR 14 along the Columbia River. The Columbia Hills State Park is located at milepost-85.